What is the best first step? What’s the best step after that? What are the little mistakes that have not-so-little impact? What are the big (really costly) mistakes sellers commonly make? 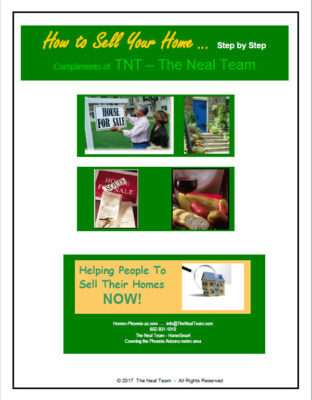 This FREE 13-page booklet, How to Sell … Step by Step, covers all the issues … from the first serious thought to collection of the check … and even beyond in terms of the things a seller MUST do during the process to ensure that there is NOT an ongoing liability lurking in transaction details and documents.Even if you don’t plan to sell for a while, this is an excellent outline and list of the issues you need to consider and prepare for. The serious Buyers … are likely to KNOW MORE about “the market” for your property than you do, because the same day they come through yours, they have been inside every comparable property within miles of yours. Close of the transaction … is NOT necessarily “close” for your “seller” liability. There are things you MUST do to ensure that the continuing liability potential is NEVER an issue. The BEST buyer … is NOT necessarily the one offering the highest price. An all-cash offer … is NOT necessarily the strongest offer. A quick close date … can be very enticing, but is it real? Can that buyer’s lender get the loan processed and funded by that date? If on that date, the buyer is not ready to close, what can be done? Should you boot that buyer out of the deal? Click Here for Your Customized Portal directly into ARMLS … unlimited access to the database and tools used by Realtors® every day … the best metro Phoenix homes information on the planet … “the” source for all such data presented anywhere on the Internet … you can get the details, pictures, everything for every property sold in your neighborhood for up to 10 years. Given the reports from that, you would have the facts to refute the low-ball offer that, if you’re lucky, is coming. TNT has the experience of 20+ years as a full-time, full-service real estate professional, and hundreds of Maricopa County home sales … and the knowledge and experience to recognize a “bad” offer, to avoid the liability traps, and to get the transaction closed … on time! We have a commitment to quality service. You can expect an initial plan customized to your property with focus on your goals and objectives; constant review and adjustment depending on results (offers, or lack thereof); constant availability; prompt actions; honest advice and feedback; and strict respect of your confidences. If you are thinking about selling a residential property located in the metro-Phoenix area, call us!